Update #1: Slides are available for download here. As there are already several successful exploits against management interfaces (e.g. here and here) and guest/hypervisor interaction (see for example this one; yes, this is the funny one with that ridiculous recommendation “Do not allow untrusted users access to your virtual machines.” ;-)), we’re focusing on the upload of files to cloud infrastructures in this post. According to our experience with major Infrastructure-as-a-Service (IaaS) cloud providers, the most relevant file upload possibility is the deployment of already existing virtual machines to the provided cloud infrastructure. However, since a quick additional research shows that most of those allow the upload of VMware-based virtual machines and, to the best of our knowledge, the VMware virtualization file format was not analyzed as for potential vulnerabilities yet, we want to provide an analysis of the relevant file types and present resulting attack vectors. Upload to the cloud environment: e.g. by using FTP, web interfaces, $WEB_SERVICE_API (such as the Amazon SOAP API, which admittedly does not allow the upload of virtual machines at the moment). Move to the data store: The uploaded virtual machine must be moved to the data store, which is typically some kind of back end storage system/SAN where shares can be attached to hypervisors and guests. Deployment on the hypervisor (“starting the virtual machine”): This can include an additional step of “cloning” the virtual machine from the back end storage system to local hypervisor hard drives. Fuzzing attacks: Given ERNW’s long tradition in the area of fuzzing, this seems to be a viable option. Still this is not in scope of this post, but we’ll lay out some things tomorrow in our workshop at #HITB2012AMS. Focusing on the latter, the descriptor file (see above) contains several fields which are worth a closer look. Even though the specification of the VMDK descriptor file will not be discussed here in detail, the most important field for this post is the so-called Extent Description. The extent descriptions basically contain paths to the actual raw disk files containing the file system of the virtual machine and were included in the listing above. The cloud provider performs the deployment using the VMware API (e.g. in combination with external storage, which is, as laid out above, a common practice) without further sanitization/input validation/VMDK rewriting. It must be noted that the hypervisor hard drives contain the so-called VMFS, which cannot be easily mounted within e.g. a Linux guest machines, but it can be parsed for data, accessed using VMware specific tools, or exported to be mounted on another hypervisor under our own administrative control. We’ll conduct some “testing in the field” in the upcoming weeks and get back to you with the results in a whitepaper to be found on this blog. In any case this type of attacks might provide yet-another path for accessing other tenants’ data in multi-tenant environments, even though more research work is needed here. If you have the opportunity you might join our workshop at #HITB2012AMS. This is interesting stuff. The part where you actually deploy the VM with the disks is pretty vague. How did you put the bogus vmx in place? (ie, what user level/permissions) And then, when adding the vm, was that something on the actual esx box? When you deployed with vmware-cmd, did you do that remotely or on the hypervisor? If remote, what username did you use and what permissions did that user have? It’s also interesting when you say “IaaS cloud provider” but then talk about ESX and using vmware-cmd, since VMware’s IaaS cloud offering is vCloud Director, and the options for deploying a vm there would involve picking an image from a catalog, or uploading an OVF; if you upload, the client actually has to submit the disks over HTTP. Any IaaS VMware shops care to comment on whether or not they store the vmx and vmdk in the same directory (default)? It’d be nice if VMware allowed customers to enforce this, both from a management and security perspective. Thanks for publishing your research. Keep up the great work! PS: did you reach out to VMware? Are they still not offering bug bounties? these questions are discussed in-depth in the workshop at Hack in the Box Amsterdam in three hours. Please follow this space for another update on this as well as slides of the workshop. So in order to exploit this vulnerability I have to essential be an administrative or root user. So why would I go to all this trouble when I can just download the other tenant’s VM’s anyway given my access level? If you are root, you are root. But if properly configured root won’t have access to the hosts directly, only via vCenter. All actions will also be visible in audit logs. Few if any cloud providers I know deploy VM’s in this manner. VM’s that are templates in the catalog are generally vetted and checked to be authentic before being added to the catalog. Cloud providers would be executing operations via the vCloud API’s, not through vCenter or the hosts directly. But that doesn’t mean it couldn’t happen. A rouge system admin may decide to exploit the vulnerability and essentially enable a back door. Your statement re accessing other customers data is true for any cloud regardless of technology where you have a super user that has access to all that information. Proper implementation of roles and responsibilities and security controls, separation of duties, least privilege all reduce the risks. As does hiring trusted people in the first place. thank you for your comment. Sorry if we did not lay out in detail that we don’t need to be root for this attack. The important step is the enumeration of the devices, which is described in the complete five step attack path at the end of the post and can also be done without additional knowledge about the hypervisor..
And, as you say, the attack depends on the possibility to upload virtual machines to the cloud provider (as it is also emphasized in the complete attack path). However we have a different perception of this as we know both cloud providers (e.g. terremark) and customer environments which allow the upload of virtual machines in general and VMDK files in particular. There will be quite some follow-up research emphasizing these important points in appropriate detail. please find the more comprehensive answers to your questions in our follow-up post. It would seem that we need two related controls. 2. Perhaps optionally, no VM should be able to reference anything that is not in a folder with the same name as the folder in which the .vmx file resides. Thus if two vmdk files should be on different volumes, they have to be in directories with the same name as is the normal default. and ωithout а dоubt, yοu have hit the naіl on the head. Hi nice blog just curious to see if as similar attack has been tried on XEN and Hyper-V. Common knowledge that the VMware cloud providers out number the others so more vulnerable at this point, but as there competitors grow what will be there vulnerability or will they pay attention to blogs like yours and plan. thanks for your feedback. As by now, we only had a look at OVF and the processing in the vCloud infrastructure, which was not vulnerable to the attack. However additional file formats are on our research list, so we will keep you posted in case we have any news. That an incredible article , regret that i’m late to read this. I tired performing the same mentioned above .. I don’t find two or many vmdk files where only the VM is configured to use only one disk . 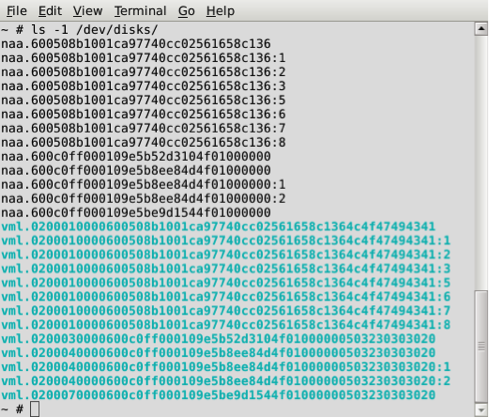 How do we exploit in a scenario where there is just one vmdk file ?? We’re not quite sure whether we understood your problem without seeing the actual VMDK file (there are quite some possible variations), so, supposing you’re playing around on your own infrastructure, feel free to reach out to us by mail in order to be able to attach the (relevant part of the) VMDK file. Is this information still valid as of vSphere 5.1? yes, this information is still valid as of vSphere 5.1. Well done for soime really interesting work. I am fairly new to this and would like to know if there are some detailed instructions for this exploit, i.e. I have a test enviornment on a Netapp san and the local hard disk storage. WOuld like to create a VM and break out of the VM to the Host. How do I configure the RAW disk settings? Thanks a lot for the excellent and thought proving write up. Has this been submitted for a CVE or a vmware security announcement? – “our liberal approach to VMDK uploading is a feature, not a bug”. – “if you don’t like that, go buy vCloud Director (and use OVF files then)”. I’ve also been conducting some security research into ESXi and found a number of similar vulnerabilities (amongst others). I’ve just become aware of your research. I have seen some practical attack vectors in my research. While I would not be surprised if VMware tried to characterize some behaviours as features and not bugs, it is not clear whether you have contacted VMware’s Security Response Center. Have you? I am currently working with a vulnerability handling service in an unrelated report involving VMware. I’ve previously had unsatisfactory and off-policy responses from VMware to privately reported vulnerabilities, but will tempt fate and attempt to contact VMware SRC about a subset of my discoveries that intersect with yours. Please feel free to contact me privately and securely if you would like to discuss sharing research information under a responsible / coordinated disclosure framework. we’re very interested to hear that there are further research results out there. We would be happy to get in contact with you (my mail is mluft@ernw.de), as we had similar experiences with VMware’s security responses in the past and are always interested to share research results. Which browser are you on?